New Delhi, April 12: Insisting the entire nation to dwell in yoga as a form of preventive healthcare, PM Modi taking a step forward in a unique way released a 3D animation video in which is seen performing Yoga. Stressing in the need to incorporate one in having a healthy lifestyle, PM Modi released a new video practising the 'Bhadrasana' and urged people to make it a part of morning routine. Sharing the new 3D video of Bhadrasana, PM Modi has reached a step ahead in encompassing people to participate in practicing yoga daily. Prior to this, the PM had shared 3D animated videos of him practising the 'Trikonasana', the 'Tadasana', the 'Vrikshasana', the 'Ardha Chakrasana' and the 'Padahastasana'. In Sanskrit ‘Bhadra’ means ‘auspicious’ and ‘asana’ means ‘pose’. Bhadrasana is mentioned as the fourth asana suitable for prolonged periods of sitting. Bhadrasana activates the root chakra or the Mooladhara chakra. Bhadrasana is an excellent posture for meditation. The posture directs the pranic energy upwards. It also calms the brain and reduces mental activity. It is mainly practiced for its spiritual benefits as it is one of the four main asanas mentioned in classical texts for practice of dhyana. Urging the nation to take a call on having ‘FitIndia’, a movement to take the nation forward on the path of fitness and wellness released the 3D animation video in which he is seen depicting Trikonasana (the triangle posture) Yoga. The Prime Minister gave this clarion call while replying to a suggestion on MyGov given by Yogesh Bhadresa, who called for greater focus on fitness and health among the people of India. 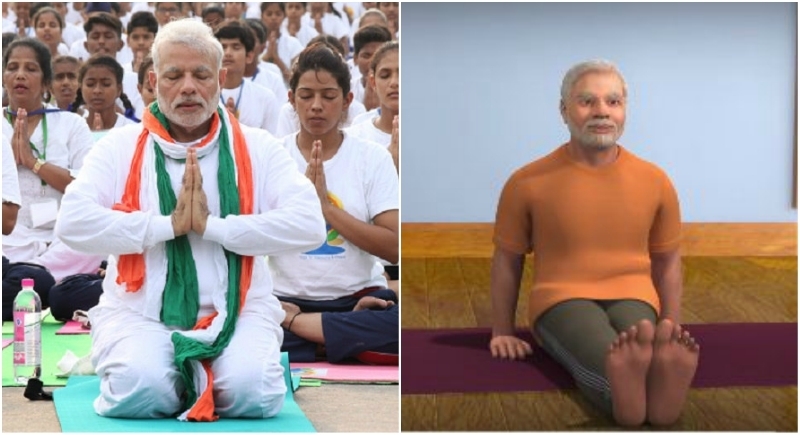 Through the 3d animation video, it is as if PM Modi is himself teaching Yoga. Most commonly used and important asanas have been covered with instructions on how to practice these Asanas, what the benefits of the respective Asana are and other such details.